Back to the 1930's with Film-Tone! From the sublime of last week's Rodd Keith two-fer, to the ridiculous of this week's Film-Tone mania. I've written before about Film-Tone, in posts which are sadly, now without their downloadable tracks, due to last year's Divshare meltdown. You can read what I've written about the company (without the files) here (that link will include this post, and three others under it). 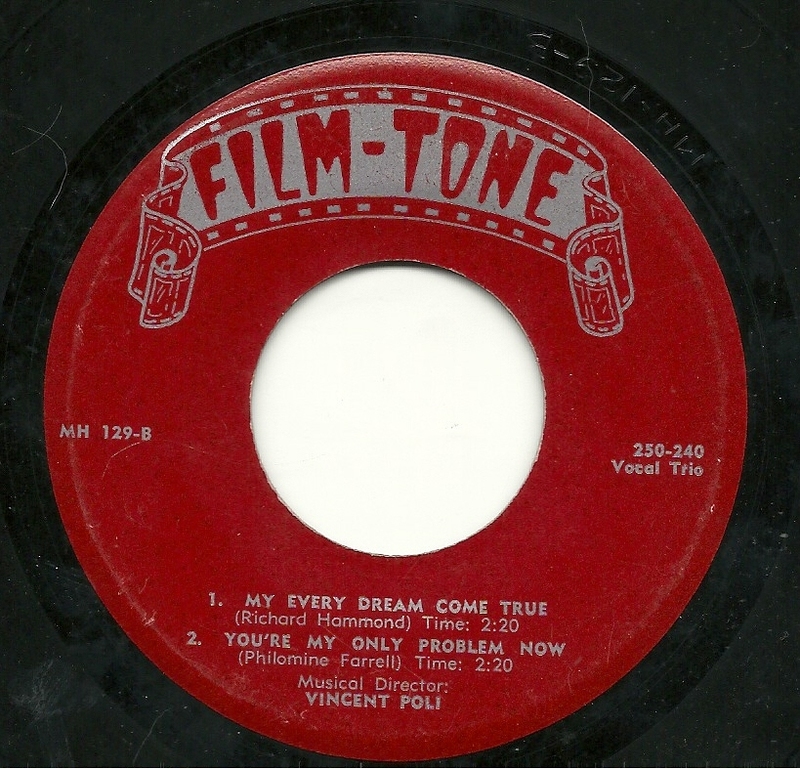 It's also worth noting that Film-Tone apparently had some sort of link with the larger Star-Crest song poem company, whose album products I've posted multiple times, including here and here. Basically, these companies seem to have existed in the '50's and '60's, producing music which sounded like it was from 30 years earlier. The only Film-Tone releases I'm aware are all EP 45's, featuring a "Vocal Trio" of two men and a woman, backed by a small combo. First up is a stereotypical song-poem of longing, perhaps unrequited love, I had a dream. If you close your eyes, you can imagine yourself at a ballroom in 1935, listening and perhaps dancing to the cut-rate group that was all the ownership could afford. 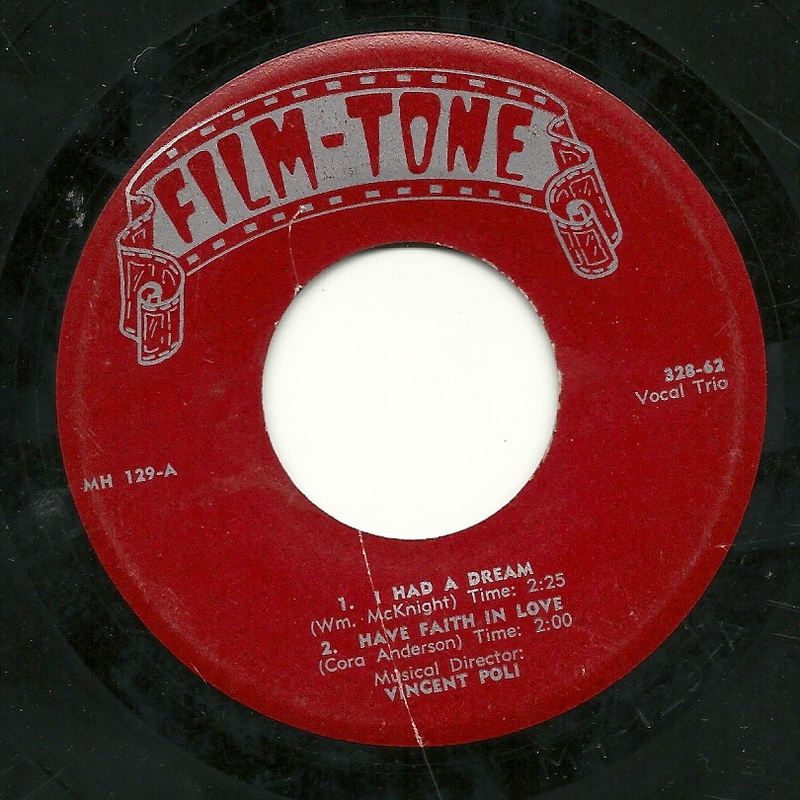 Next up is "Have Faith in Love", a religiously inspired lyric from a wife to her husband. Unlike the previous track, I can't even imagine a scenario in which I'd be listening to this material, performed live. Flipping the record over, we hear "My Every Dream Came True". Here, the band has adopted a light Latin beat which one might have heard, again, in the 1930's, and I find myself back in the ballroom from the first track. I remain confounded, as I always do with this label's material being sung by a mixed group, as the lyrics - many of which tend to be written with one gender in mind, singing to the other - are indiscriminately given to a male singer to sing solo, followed immediately by the group, led by the female singer. I took a couple of weeks off, but since this project is called "Song Poem of the Week", I thought I'd make the effort this time to make up for lost time, and provide two very nice early-period Preview singles featuring Rodd Keith. 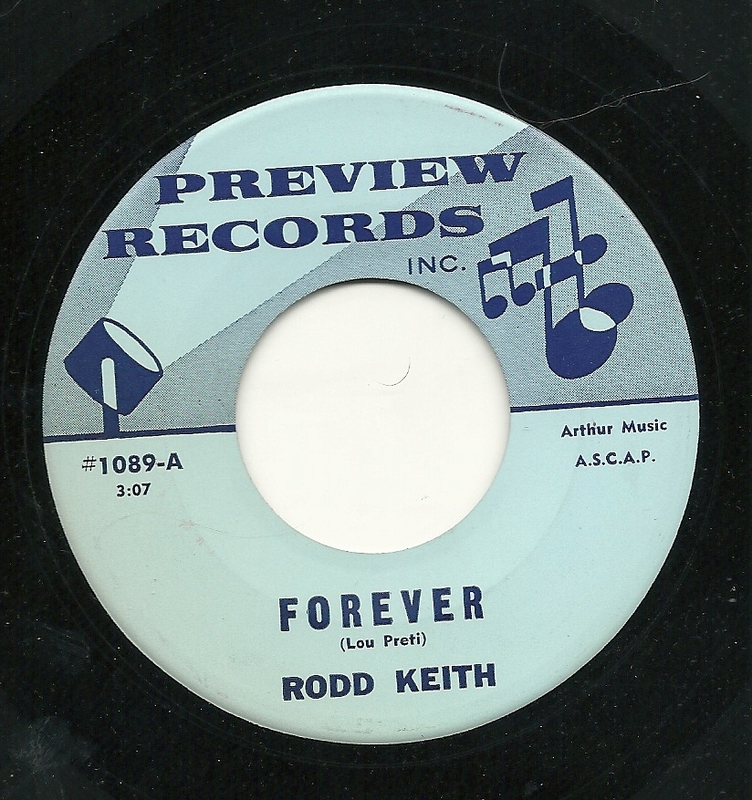 The better side of the first record, by far, is a song with the generic title "Forever". This proves to be one of those super-soulful Rodd sides, with some particularly outstanding drumming, sweet guitar, and a wonderfully warm vocal from Rodd. In an oddity which turns up from time to time on Preview singles, the record actually runs more than 50 seconds shorter than the label reports it does. 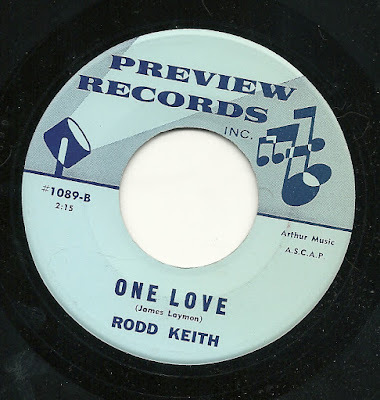 The flip side, "One Love", is not, of course, the Bob Marley song (and wouldn't that be something to hear), but a rather innocuous pop ballad, with bland lyrics and accompaniment redeemed a bit by another nice lead vocal. I can't drum up any enthusiasm for this record's flip side, "Faith and Prayers", whatsoever. Again we have a misleading length on the label, although in this case, the record is an excruciating extra minute longer than reported. The backing here is almost ridiculously minimalist, little more than just a guitar and a bass, neither one of which makes it through the track without making mistakes. 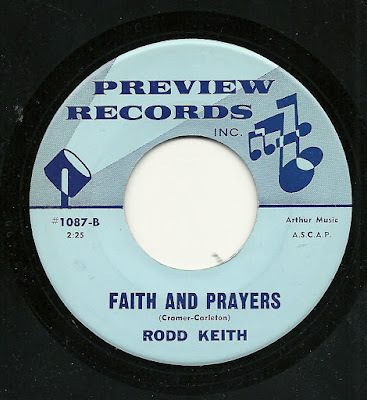 The words are heartfelt, in honor of soldiers overseas, living and dead, but neither the arrangement or Rodd's vocal draws my attention to those words or their meaning. A Missile Heading Straight to the Top of the Charts! 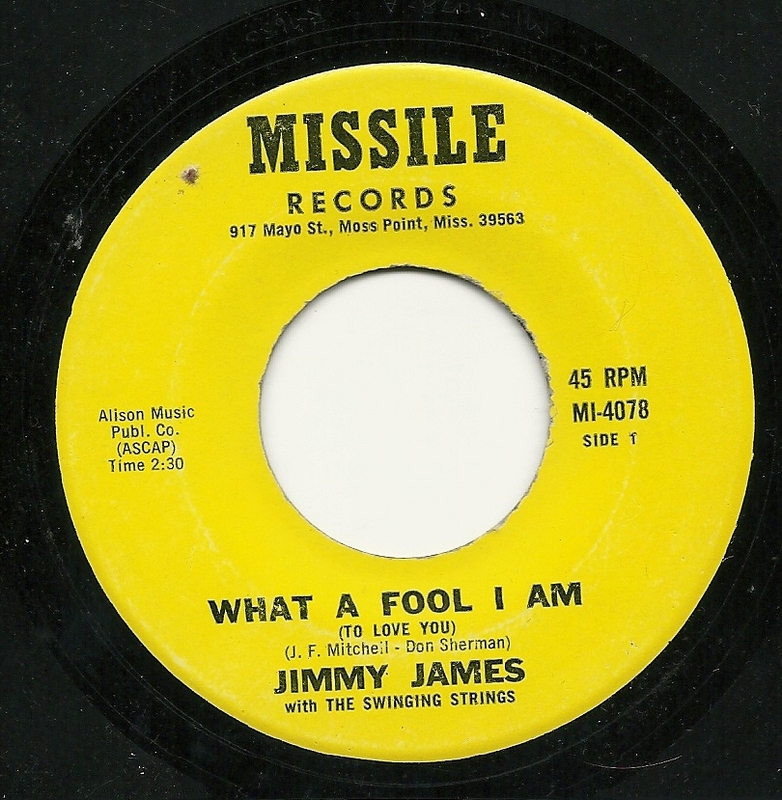 Here's a previously unknown song-poem label, Missile Records, clearly a branch of Sandy Stanton's Film City family of labels, as evidenced by the presence of late-era Film City mainstay Jimmy James (best experienced on "Free Love for Sale" and "Mini Girl Song", both of which can be heard here), and the identification of the Chamberlin backing as "The Swinging Strings". And it's that Chamberlin backing that drew me back into the A-side of this record, after the first listening. 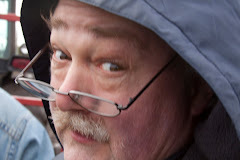 One of my all time top 25 song poems is a record called "My Point of View", but Gus Hewstan (see below), which I shared on this site ages ago, in a post which contains dead links, due to the divshare collapse. One of the many things I LOVE about the Gus Hewstan record is the backing setting that whoever played the Chamberlin chose for the track. And I'd never heard that particular setting before or, until this record, since. And then, here it was, on Jimmy James' performance of "What a Fool I Am". It's not used to as great effect, but it's still an interesting, busy and even convoluted beat, although slowed down here from the other record. 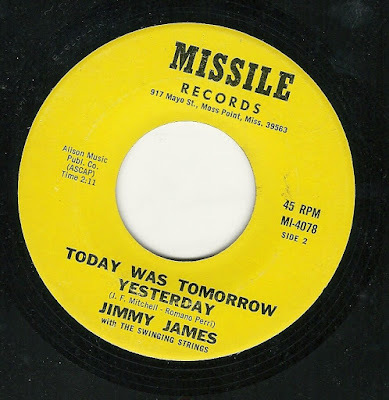 Jimmy James offers up a soulful vocal, duetting with himself here and there, and there is the usual film city/Chamberlin weirdness of sound to draw me in. On the flip side, double-tracked (and sometimes harmonizing) Jimmy informs us of the song-poet's amazing insight, that "Today Was Tomorrow Yesterday". And I'm a sucker for these mechanical sounding Film City products, so this one appeals to me, as well. Since the original posting no longer works, here is the Gus Hewstan record I referred to above, in all its glory.